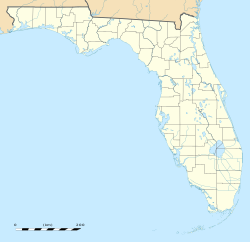 Verona Walk is a census-designated place (CDP) in Collier County, Florida, United States. The population was 1,782 at the 2010 census. It is part of the Naples–Marco Island Metropolitan Statistical Area. Verona Walk is located in western Collier County at 26°5′14″N 81°40′43″W﻿ / ﻿26.08722°N 81.67861°W﻿ / 26.08722; -81.67861. It is bordered to the west by Lely Resort. Collier Boulevard forms the western edge of the CDP. According to the United States Census Bureau, Verona Walk has a total area of 1.6 square miles (4.1 km2), all land. ^ a b "Geographic Identifiers: 2010 Demographic Profile Data (G001): Verona Walk CDP, Florida". U.S. Census Bureau, American Factfinder. Retrieved July 17, 2014. This page was last edited on 9 December 2017, at 09:04 (UTC).